If the bitmap images that you have imported look blurry or slightly pixelated, follow the steps below to clean-up the image. These steps will effect the quality of the preview in Camera view, but will have no effect on the final render. 1. In the Camera view, double-click on the bitmap image to enter its symbol if the image is encapsulated or simply select the bitmap image layer in the Timeline view if it isn’t. 2. In the top menu, select View > Bitmap Image Quality or press [Ctrl] + [Q] (All Platforms). 3. The Bitmap Image Quality dialog box opens. 4. 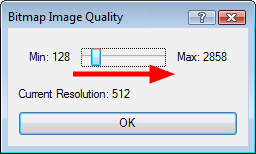 Drag drag the Bitmap Image Quality slider to the right to improve the quality. 6. If you are inside a symbol, go to the top of the Camera view and click on Top to exit the symbol and return to your scene.